How would you like your business name to appear on the map? Enter your contact details as you would like it to appear on the map. Enter either your phone number or e-mail address or web address. Please read the Terms and Conditions below before completing your purchase. If you are a member of the 4HTA you can get a £60.00 discount on this product. log in before purchase, or click here for more details. This product will give you one slot on the 1st edition of the Four Heatons Map. The map is scheduled to be launched in April 2019. 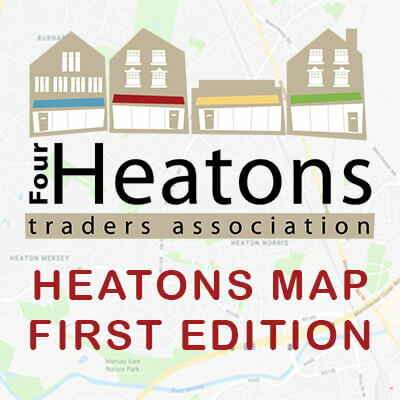 The Four Heatons Map will be printed and distributed via shops, the Train station and other outlets. The map is designed to increase footfall into the Heatons, giving a boost to the local economy. Purchase of this product does not guarantee you a slot on the map. As spaces are limited, if we are oversubscribed then priority will be given to members. As the intention of the map is to increase footfall into the Heatons, priority will also be given to shop-front businesses over non-shop-front businesses. However, we will aim to accommodate as many applicants as possible. In the event that we are not able to give you a slot on the map, your payment will be refunded in full. Refunds will be limited to the total value of the payment of this product. PLEASE NOTE: A Refund on this product will NOT entitle you to a refund on your membership fee. At the time of purchase, you will be asked to provide the company name and either the contact e-mail or phone number (not both) to be printed on the map. It is your responsibility to check the accuracy of this information. The 4HTA cannot accept responsibility for inaccurate information. After purchase, if you need to change the data please e-mail admin@fourheatons.co.uk. However depending on the how far the design has been progressed, it may not be possible to accept changes. Purchase and successful allocation of a slot on this edition of the map does not automatically entitle you to a slot on subsequent maps.